What a great success for Nak Suu and the Bangkok International 10′s rugby tournament. The weekend brought together nations from all over the world as well as provided opportunity for each team to hone and test their rugby skills. Our own Nak Suu rugby teams from each age category played exceptionally well. Several parents and coaches from the winning tournament team, stated how hard our Nak Suu kids played. A referee commented that the Nak Suu teams exhibited “great character and attitudes and they were a pleasure to referee”. Nak Suu kids, we at ARK International are proud of each and every one of you! “Last weekend, Feb 18-19th, we (DTS Perth) had the opportunity to volunteer with Nak Suu at the Bangkok International 10’s rugby tournament. I really felt that the tournament atmosphere and set up was an amazing experience for the kids from Nak Suu. Most of the other teams have grown up around rugby and most likely this is not just a rugby competition but an experience overseas. I was aware that the kids from Nak Suu were treated not only as worthy competition but also as worthy persons that deserve respect, opportunity and recognition of who they are and what they can achieve, which is huge in building self-esteem and confidence. I especially loved seeing each of the kids being recognized with a medal as well as a team trophy for their efforts and participation in the event. This week is one of our busiest of the entire year! We are bustling about preparing for the Bangkok International Tens Tournament. Not only is this the “big game” we spend most of the year practising for, it’s also the main fundraiser for the Nak Suu Rugby Academy as the it is the main sponsored charity. 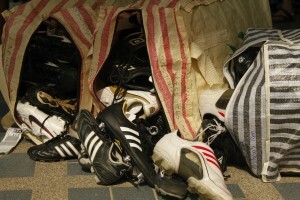 Pumping rugby balls, sizing shoes and uniforms, setting up information booths and buying massive amounts of food are just a few of the preparations. Of course, lots and lots of rugby PRACTICE is required. Last year, our under 11 team won first place in the tournament. What an incredible self-esteem and confidence booster for the boys. The over 11 yrs. team did excellent as well as they came in 2nd place. 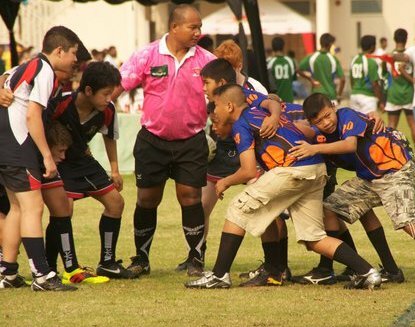 The tournament this year will run from the 18th -19th of February at Bangkok Patana School with the youth rugby games played from 8 am to noon. The men’s games will be played in the afternoon with twenty-two international teams competing. Three Nak Suu teams are registered in the youth program this year: under 16 boys, under 12 boys, and under 11 mixed. This is the first time our girls will be playing and they are so very excited about it! This event is made possible by dedicated volunteers and sponsors. If you would like to volunteer at the tournament or would like to support with a donation please contact us at arkthailand@gmail or use the contact form on the arkintl.org website under contact tab. All are welcome to come cheer our teams on! Stay posted for tournament results and highlights coming soon. Making a BIG difference starts with a little idea, and BIG heart to see it done. “I just wanted to do something.” That’s what teen-ager, Jess Neilson, said Wednesday, after she fundraised, promoted and delivered from Vancouver, BC, Canada, IN PERSON to Bangkok — 80 pairs of Rugby cleats for the children at the NAK SUU Tigers Rugby Academy in Thailand! MARCH came in like a TIGER, a Nak Suu Tiger! 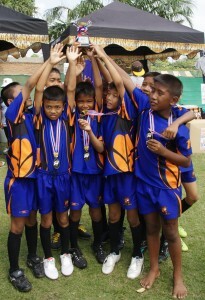 Our Rugby program had huge success at the Bangkok International Tens, and we saw a bunch more kids jump on board! In APRIL, we enjoyed sharing the message of the resurrection of Jesus with kids in Live LIFE, and even saw a group of 10+ kids accept the message of the gospel and wanted to know Him personally! The Jesus Film, from Campus Crusade for Christ was a huge help! Thank you for the Thai translation that we got to play on our projector for the kids! It was great because the video is streamed and we had NO PROBLEMS the entire time we watched the movie. Thank you for praying for us. We saw the Lord answer incredible prayers THAT day! MAY was the month we taught on ’forgiveness.’ Wow, it challenged us as a team, too! JUNE was time when our Nak Suu teams joined another big Bangkok scrimmage. The BC Lions, and another international Japanese team devoted an entire Saturday to playing in several games and joining our practices. For our kids, it was so great for them to join some international players. Almost all of which spoke a diffident languages than they did, but they learned they can all speak “Rugby.” Much respect and many friendships were made that day despite the language & culture barrier! Cheers to you, BC Lions, Coaches and friends! We received a great gift in JULY. Another family added to our team of staff! Thanks Michelle, Aaron and Micah for joining us, your gifts and your commitment are refreshment to our team! We have just finished our National YWAM Thailand Conference and are excited for the new things the Lord has shared with each of us and as a team! We consider it a privilege to serving and fighting for Children at Risk in Bangkok…together we can prevent trafficking and transform children’s lives. One child at a time. We, at ARK International, pray this update finds you living in the abundance of the Love of the Lord! It has had an incredible start to the first quarter for the 2011 Year! After the supply room fire at our office on November 7, 2010, losing about 50,000 Thai Baht in merchandise and supplies, we were quickly surprised to find so many of you responding to the tragic news. The LORD prevented any injuries to our team and we actually realized how much we depend on one another through that event. Our ARK director, Sopo Fakaua, put out the fire at approximately 8:30am, that Sunday after our 1st official Nak Suu Fundraiser the night before. The ARK International team spent the entire Sunday cleaning up the damage and repairing what we could. December gave us and the children in our ministry a huge boost. It was an incredible time sharing the love of Jesus with many children who had never even heard His name spoken before. Both at our NAK SUU Rugby Academy and LIVE Life we were able to share the story of the good news in fresh new ways. The children even had a chance to participate in a small play telling the story of Jesus’ birth! January snuck up on us! We realized we were in a brand new year, excited for all that is ahead. It, also, was a time to get back with each of our programs and reconnect after a brief break for the holidays. We prepared a new program for NAK SUU, seeing a group of children from a boys’ home in Bangkok come back to our program after months of early morning prayer and much communication with their directors. The boys in the home were as glad to be back at NAK SUU as we were to be with them again. It seemed like family had been reunited! Our Saturday program quickly went from about 40 children weekly to 80! February, however, has been the busiest and most exciting month so far! Our NAK SUU Tigers Rugby Academy’s first ever-tournament, where they were also the sponsored charity, was quite a challenge both for our 80+ children and for our 8 person staff & the 16+ volunteers that blessed us by their participation and support! Also, shortly after the tournament ended, in the middle of February, YWAM Thailand’s Dagmar Geiger and Ian Talbot hosted a leadership training meeting for our staff. We followed through by our yearly ARK Thailand vision meeting. While at the same time 14 students and staff from the YWAM Perth Sports DTS team and 8 staff and students from the Foundations in Counseling Ministry School arrived to help expand our programs and the opportunities that we had to share the love of the Lord all over Bangkok! We have seen three new programs begin in the last month, also. Pod Groups, a small group program, focusing on deeper relationships with the children and their knowledge of how awesome God is has begun in 2 of our Communities and now LIVE Life 2 has begun in another neighborhood on the other side of Bangkok! Energy and Excitement are the only two words to truly describe what happened this past Saturday. It was amazing to see how much excitement these children had because they had a chance to get out of the rather hopeless environment that they live in of poverty and neglect and get into an area where they are truly cared about because of the love of God. The kids were so excited to play rugby it gives me even more passion and excitement to see what else God has in store for them. We had 50 plus Children from 4 slums of Bangkok and a boy’s orphanage. We split the kids into two groups and while one group did discipleship the other was on the field running around playing rugby. I am sure that the world could be powered by then energy of one excited child. The place was alive with children laughing and running around with uncontrollable smiles. In discipleship we spoke about how Christ was the light of the world and even in the darkness that is around them they have light because of God. Discipleship takes a long time especially with children who don’t know anything about God but the little bit of light that they got this week will change their lives. Changing lives one Child at a time that is what it is all about. Please partner with us in praying the God continues to open doors so that more and more children can come out on Saturday. Pray that the word gets out about the Nak Suu Tigers and that God becomes famous. Please pray for continued safety as the political unrest continues here in Bangkok. Something that has truly been on our hearts is that the children’s hearts be extremely soft to God speaking to them. This week we are talking about how God knows everything pray that they have peace in knowing that God knows them and knows what they need! We have never been in the slums more than we have the past three weeks. Not only is it a bit of a journey so visit the children we work with, but it is emotionally exhausting seeing them live in some of the tough situations that they must face. But nonetheless the rewards are much more invigorating. To see kids with very little have joy just because they see someone that doesn’t have to care for them but does anyway is priceless. It is so important for us to visit these kids where they live, in addition to our projects that they come to once a week. We are all moved by the stories that come out of one of our communities, Samut Prakarn. Many of our kids that live there are Cambodian and many have stories that are more than memorable. One of our kids had his cousin just come from Cambodia because her mother and father had died. No one knows what is going through a ten year olds head but her face showed complete despair. To see someone who has had their life, as they know it, torn from them and transform right in front of you because of individual attention is amazing. She started to smile and then she couldn’t stop it. Her head was shaved in mourning for losing her parents but the joy she now possessed made her love having pictures taken of her, beautiful. Weeks have passed and more visits have been made and Nak Suu Saturdays have come and things change but that smile remains the same, unwavering, an example of a life Transformed. We only have this program as a platform to build relationships with children and it is amazing to see how God is working through us and using us.